It’s still a bit early, so the bar is more or less empty. The fact that it’s still light outside doesn’t stop the bar from looking like a dank pit. We see DORIAN and TOM sitting at the bar. DORIAN has replaced his standard martini with a large glass of hard whiskey, even more imposing than TOM’S usual drink of choice. DORIAN is completely crushed and disheartened after his meeting at FELPAK. He’s sobbing into his drink. I was really hoping it’d work out for you. I saw this coming, but, uh, sorry, man. I didn’t think you’d take it so hard. I sort of thought you’d expect this also. I thought it was just some sort of bizarre joke. Well, until we actually got to the cannery. If it’s a joke, well, you’re an exquisite actor. But, man, I’m sorry. I wish there was something I could do to help. TOM and DORIAN sit in silence. DORIAN goes between downing his booze and weeping. TOM just sits there uncomfortably. Finally, DORIAN speaks. Bartender, could I have another? The bartender comes into frame, places another giant glass of liquor down in front of DORIAN, who fumbles with his pockets, finds the money and pays him. The bartender goes back out of frame. You’re (pause) – you’re drinking an awful lot, there, Dorian. I know you drink a lot, but, well, this is a lot, even for you. Don’t you think you should stop soon? Here, let me have that glass. Dore, this isn’t good for you. Stop it. Ooh, no, I wouldn’t want to ruin my liver! After all, I’m not dying in six months, and I’m not going to have my body rendered and put into cans. Well, not anymore. What’s the point? I mean, it didn’t really matter before, and it really doesn’t matter now. Look, Dore, look. Yeah, you’re going to die, and yeah, your first plan didn’t go through, but (pause) look, you haven’t been showing any signs of cancer, don’t you think you should, y’know, be aware so you can enjoy this? Since, look, it’s not going to last for long. I’m surprised that you’re this healthy now. And, well, cancer’s incredibly painful, you’ve said so yourself. You’d best enjoy it while you can. Just (pause) shut (pause) up. Dore, look. You’ve got to stop this. You’re giving up already? Come on, there’ve got to me more canneries in this city. Look, I’ll tell you what, OK? I’ll tell my boss that I’ve been hospitalized from the salmonella, and that I’ll be out a week. And then we’ll go to some more tinning plants, all right? There’s got to be one out there, OK? Look, OK, so you can’t get Felpak. Life is full of compromises. There’s plenty of other canneries and there’s got to be one that’s suitable for you. But, Felpak is the jewel of the tinning industry. Yeah, but you’ve got to face it. They’re out. They won’t go for it. So, you’re going to have to settle. I don’t want to settle. I’m dying here, don’t I get some sort of special treatment? Don’t I get a free small sundae or anything? This is the only thing I want, and it’s not going through. Well, have you even looked at the other canneries? Maybe there’s one that’s just as good. I haven’t, but.. what’s the point? They’re not Felpak. Just stop it. Let’s go home. You’re going home, Dorian. You’re in no condition to have another party. I don’t care, I want a party. Fine, there’ll be a party there. Good. Now let’s go, I’ve got to get ready. DORIAN shakily stands up, fishes his keys out of his pocket and holds them up. TOM goes to take them, but DORIAN pulls them away at the last second. TOM’S a bit drunk also, but not even half as so as DORIAN. No, it’s my car, and you’re drunk. Yeah, but it’s my car and I’m drunker. I got trump. It’s about We see DORIAN’S car parked, for lack of a better word, on the pathway to his front door. The car’s not in the best of condition, but it doesn’t have any trouble running. We pan over and see TOM leading DORIAN into the back door. …and passes out on the couch. It’s the next morning. DORIAN is already up, and sort of staggers around. TOM is still asleep on the couch, even though he had much less to drink. DORIAN staggers to the liquor cabinet and pulls out a bottle of whiskey. He takes a couple of gulps and replaces it. TOM stirs. Man, that couch isn’t comfortable. It’s like, I sleep for longer on it, but it’s a much more unsatisfactory sleep. Hey, you didn’t need to sleep here. Anyway, uh, why are you still here? Do you want to take me up on my offer? The thing where I call in hospitalized to work, and we go find other tinning plants. Yeah, I guess. Maybe we’ll find something. I hate to compromise though. OK, cool then. Give me the phone. DORIAN hands him the receiver of a cordless phone. TOM dials. Hello, Tom. How are you feeling? It looks like I’ve taken a turn for the worse. Yeah, they put me in the hospital. I think I’m going to be laid up for a week. This salmonella’s really got me around the ankles, here. (pauses) It sounds it. Where are you staying? (long pause) Uh, the big hospital. They say no visitors or anything though. Too many, uh, outside germs. (pause) Are you sure you’re not just nursing a hangover? You didn’t just go on a day and a half long bender? No, sir! Salmonella. From my lunch. Whatever, I don’t care. I’ve got bigger things to deal with. Just remember, this is unpaid, since you’ve already used up your sick days. If you hadn’t, I’d probably care more, but, as it is, you’re probably saving us money. So, enjoy your “salmonella”. Pretty well. I would have thought he’d have cared more, but oh well. Do you got any whiskey? Hair of the dog and all that. DORIAN goes back to the liquor cabinet, gets the whiskey, tosses it to TOM. TOM misses, but picks up the bottle from the floor, and takes a few more gulps. He sloshes the bottle around, to find that it’s almost empty, and polishes it off. OK, cool, now that that’s taken care of, let’s get cleaned up. While I’m in the shower, you start calling up places and making appointments. Go for as early as you can. I doubt that you’d have problems, since, well, the president of a cannery can’t have a whole lot to do. We see DORIAN and TOM staring up at the side of the building, like at Felpak, although DORIAN clearly doesn’t have the same sense of awe. Both TOM and DORIAN are more curious than anything else. The lobby for Hennessey isn’t nearly as impressive either, but it’s not shabby by any means. It’s closer to what you’d expect a cannery’s main offices to look like. At a smaller desk, we see a SECRETARY. …Howesebury, and we’re here to see Mr. Hennessey. The SECRETARY leads DORIAN and TOM down a corridor, and opens a non-descript wooden door. She steps inside. Mr. Gray and Mr. Howesebury to see you, sir. She beckons them inside and then leaves. TOM and DORIAN sit down. MR. HENNESSEY is sitting behind a nice desk, but one much smaller than MR. STEEVERSON’S. MR. HENNESSEY is also rather old, although less formal. So, boys, what can I do you for? Well, sir, I was wondering if your cannery does special, limited runs. Hmm, we normally don’t do outside work, although, times have been a little hard lately, so, well, what are you thinking about? We’re rather open, I like to think that Hennessey Canning is a bit unorthodox. That’s great! That really puts my mind at ease. So, what’s the nature of your proposal? I’m sorry to hear that, Mr. Gray, but I think I understand, you want us to cater your funeral? I agree, that is a bit unorthodox, but you must really love tuna if you want to serve it to your guests, and I’d be happy to help you out, however I can. Actually, sir, that’s not quite what I had in mind. Oh, it’s not? Well, that’s fine. We primarily deal in tuna, although we’d be willing to help you out with a different sort of fish, if you’d like. Of course, you’d have to provide the fish yourself, but I wouldn’t see a trouble with that. We might even be able to handle deviled ham, or chipped beef. I don’t think that’d be a problem – I can give the foreman a call if you like! MR. HENNESSEY reaches for the phone. No, no, sir, you don’t have to do that. I’m not really looking for a caterer or anything of that sort. (pauses) What do you want then? We primarily deal in foodstuffs, so, well, if you don’t want fish, then, well, what can we do for you? Well, as I said, I was dying of cancer, and I’ll probably be dead in about six months. Yes, Mr. Gray, I’m terribly sorry about that. Oh, don’t be, you didn’t do anything! DORIAN and MR. HENNESSEY both laugh, DORIAN heartily, MR. HENNESSEY nervously. TOM smiles uneasily, knowing what’s coming. Anyway, though, well, what I was wondering is, well, when I die, I was hoping that maybe you could, well, chop me up and put me in cans, to put it bluntly. MR. HENNESSEY laughs again, although a bit looser, this time. DORIAN joins in. TOM chuckles a small amount. Oh, that’s very good! Seriously, though, what services do you want us to provide? I (pause) was being serious, sir. (pause) You want us to render your corpse, and then can you? Yes, so that way my friends can have a little bit of me. (pause) Have you considered cremation? Because it’s the more socially acceptable option? I’m sorry, Mr. Gray, but we can’t really.. do that. It’s, well, we could lose our license. That’s incredibly unsanitary, if also (pause) very (longer pause) unsettling. Well, I’m not going to feel it, I’m not saying to do it now. I suppose that is true, but, just the same. Please, sir? I’m very wealthy, and I’d pay for not only the labor and materials, but also for the cleaning of the machinery. I know you’d want to clean it before and after. I (pause) appreciate your generosity, but I don’t think I could (pause) inflict that on my workers. Don’t you think it would be a little traumatic for them to see a human body being put into tins? Many tins? I mean, I’d say that you’re about (pauses as he sizes up Dorian), oh, maybe a hundred cans or so. As a rough estimate. Maybe a little less. I don’t know, I’ve never tinned a person before. (to himself) Man, I must be really putting on the weight. (to MR. HENNESSEY) Are you sure? Is there anything that I could do? I don’t think so, Mr. Gray. I could phone down to the foreman, but, well, I’d prefer not to. I think you’ll understand. (sighs) I suppose. Thank you for your time. I’m sorry, gentlemen. I hope you have better luck in your quest. DORIAN leaves MR. HENNESSEY’S office dejected. TOM stands up, shakes MR. HENNESSEY’S hand goodbye, and follows him. Again, the top is down, and TOM and DORIAN are speaking loudly to be heard. The car moves a little slower this time, and a slight clunking noise is heard emanating from the car. Yeah, at least he listened to us. I’m just glad he didn’t throw us out. He was a pretty good egg. If I couldn’t get into Felpak, I’d like to be a Hennessey. You couldn’t get into either. DORIAN is silent. TOM’S comment has hurt him a little. Anyway, I’ve got an idea for this one. A different approach. At this point, DORIAN’S CAR drives past the Kone Cans & More building, and turns into a nearby parking lot. Another president’s office, much like the other two, although closer to MR. HENNESSEY’S office in the amount of opulence, although where HENNESSEY’S was more classical and traditional, MS. KONE’S is modern. MS. KONE herself is young for a CEO, perhaps in the beginning of her 40s. TOM and DORIAN are already sitting in front of her desk. Hello, Ms. Kane, I’m Tom Howesebury, and this is Dorian Gray, and we’re here to make a business proposition for you! What sort of business proposition? One where by just taking this contract, you can generate lots of publicity for yourself – and we’ll pay you! This isn’t illegal, is it? 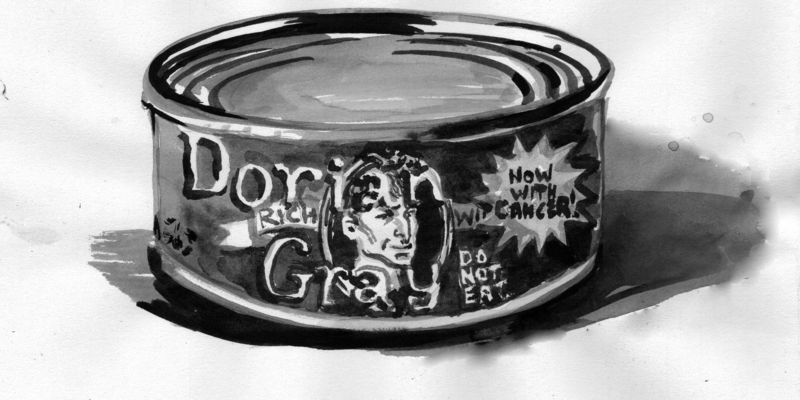 Legality’s such a gray issue – a gray issue, much like Dorian Gray, here! Tell her, Mr. Gray, about this chance to get the name of Kone Cans & More in papers worldwide as a synonym for generosity! We see DORIAN and TOM being frog-marched out the main doors by security. Excuse me, uh, we parked in the indoor parking lot. The elevator door opens and the security guard is still frog-marching DORIAN and TOM. Ah, that’s right, this one is our floor, thanks. The security guard gives the two of them a bit of a shove, and goes back on the elevator, to return to his post. DORIAN and TOM walk to DORIAN’S car. Well, we still have a few days to go. Want to start again tomorrow? Yeah, I’m a bit tired. Want me to pick you up? DORIAN and TOM get into DORIAN’S car and drive off. We see TOM and DORIAN sitting at another desk, as they have been. The same shot, only TOM and DORIAN are wearing different clothing. The same shot, only TOM and DORIAN are wearing still different clothing. Again, the same shot, only TOM and DORIAN are wearing another set of different clothing. How dare you waste my time? Same thing. Again, different clothing. Over each iteration, DORIAN gets more depressed. You’re a horrible, horrible person! How can you even joke about cancer? My wife died of cancer! Different clothing, same shot, dejected DORIAN. All right, we’ll do that. DORIAN perks up a bit. We see the camera cut to who DORIAN is talking to. We see that PRESIDENT 6’s office is easily the most shabby. In fact, the place is a dive. PRESIDENT 6 is another youngish CEO, although, where MS. KONE was very professional, he’s very dirty and disheveled. He has a bit of a mean smile. Hey, sure, kid, y’know, anything to help out someone who’s dying. Cancer’s pretty tough. That’s how my parents went. Both of ‘em. That’s how I know. So, y’know, anything to help out, that’s what I’m sayin’. That’s great, thanks! I’ll have my lawyer work something and we’ll be in touch. PRESIDENT 6 hands DORIAN an off-white, almost dingy, business card. My summary – Dorian Gray chapters: 1-2.